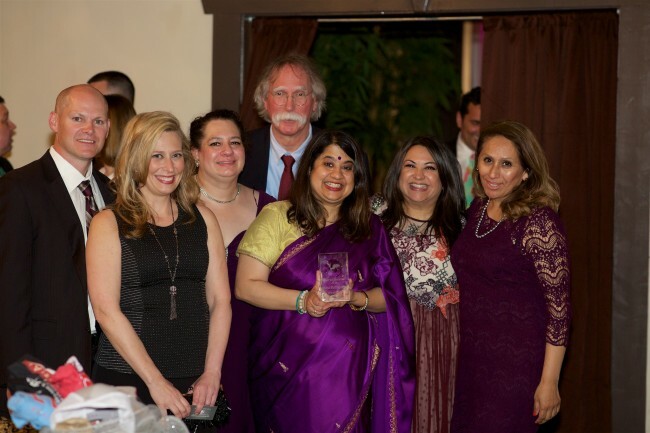 Atlanta, GA, May 18, 2018: Raksha’s Executive Director, Aparna Bhattacharyya was given the Hope for Tomorrow Award at International Women’s House’s 10th Annual Night of New Beginnings Gala in recognition of her work for women and children in the community. The event was held at Le Fais do do on March 17, 2018. Ms. Bhattacharyya represented Raksha on the steering committee to start International women’s house in the late 1990s and served on its Board of Directors. After receiving the award, Ms. Bhattacharyya talked about the history of International Women’s House, which was started after a Vietnamese woman was shot by her husband after she got her divorce. She shared the history of the different organizations that came together to ensure that the shelter met the needs of immigrant and refugee women and their children. Anna Z. Blau, the Executive Director of International Women’s House, introduced Ms Bhattacharyya. She said there was no one more deserving of this award given the dedication Ms. Bhattacharyya has given in her work for immigrant and refugee survivors. Ms. Bhattacharyya went on to share her hopes for a new tomorrow which included her hope around youth throughout the nation who have been taking stands to address gun violence and access to mental health in their schools, to ensure that survivors don’t have to to deal with anti immigrant sentiment, islamaphobia, homophobia or transphobia when seeking help and shelter after leaving abusive relationships, that schools and communities provide tools to create healthy relationships, that children witnessing and experiencing violence in their homes could have access to counseling and support without having to get their parent’s consent, that our legislators are not creating laws that make it harder for survivors to come forward, that we have housing solutions that go beyond traditional shelter and that survivors don’t have to worry about making three times their income in order to get an apartment for themselves and their children, that survivors don’t have live in one room hotels with their children for years before they can afford an apartment, and that ultimately that we will have collectively have found a solution to end violence in our homes, schools and communities.